Digital Visual Interface (DVI) is the standard interface for a high-performance connection between PCs and flat panel displays, digital CRT displays, projectors, and HDTV. These precision-engineered cables are fully compliant with the DVI standard defined by DDWG (Digital Display Working Group). 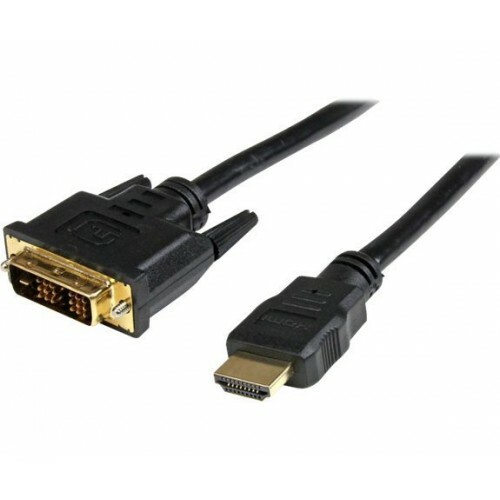 This premium high performance Golden Plated HDMI to DVI-D Cable supports HDCP, high-bandwidth, uncompressed video, prevents signal loss and screen ghosting. Supports multiple audio formats from stereo to multi-channel sound. Transfer Digital Audio and Video signals at warp speed of 5 Gigabytes per second! Suggested Applications: is ideal for connecting digital displays such as DTVs, plasma displays, LCD TVs, and projectors to digital source devices, such as DVD players/recorders, digital set-top boxes, LCD Displays, Projectors, Plasmas, HDTVs, and AV receivers.